Although I teach Matsubayashi-Ryu, we have enhanced the curriculum by adding skills training outside of traditional karate do. Let me be clear, Matsubayashi-Ryu remains unchanged. The additions I refer to enhancements, nothing more, to account for the realities of our changing world and include skills sets like, firearm marksmanship, edged weapons, stick fighting, urban SERE (survival, escape, resistance & evasion), and improvised weapons of opportunity to name a few. 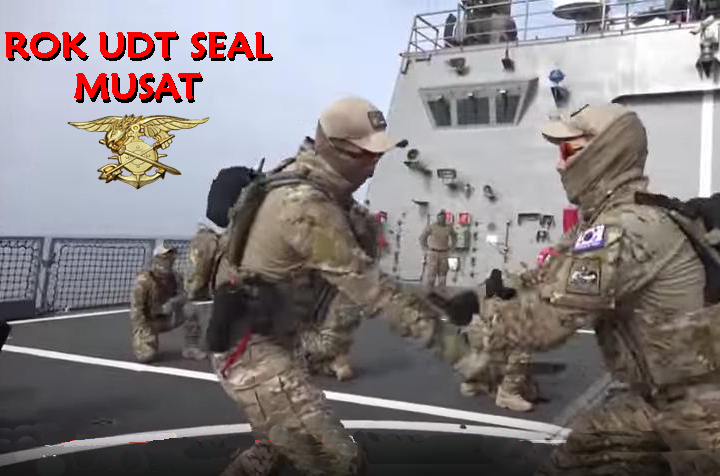 Last week I was presenting a very basic ROK SEAL MUSAT (Multi UDT SEAL Assaulting Tactics) knife drill very similar to a kata of sorts (no I wasn't in the Navy, wasn't a SEAL, wasn't in Sec Ops, etc. In fact I swim like a large rock) but I do have friends in low places. A single man drill prepares one for the two man "kata" they have developed. Actually it's fairly similar to a SPETSNAZ drill I have seen. While we used rubber blades the ROKs use live blades. After class, as we always do, we debriefed. As one thing led to another we somehow landed on "The Karate Kid" (the original, not the Jaden Smith abomination). 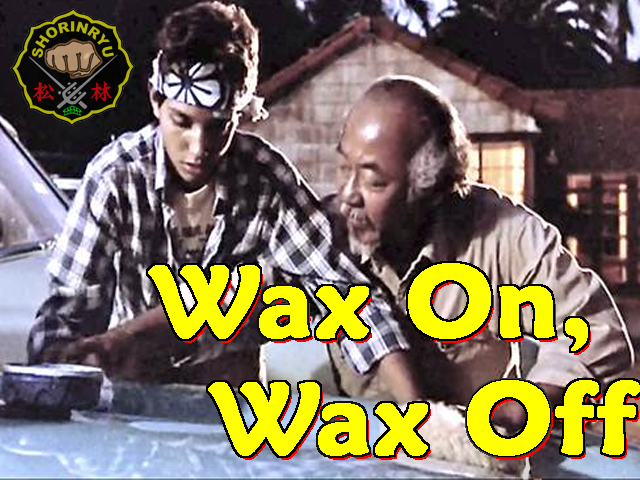 It seems no one can talk "Karate Kid" for more than 10 seconds before someone says "Wax on, Wax off"! Everyone laughed and off we went but, at some level, it lingered inside me. Eventually it percolated into awareness and insight. People laugh at the Karate Kid's, "Wax on, Wax off" because they see it as an over simplification of what the martial arts really are. After some thought, it occurs there is little that represents the true nature of karate more than "Wax on, Wax off", if you expand your thinking. For the 3 of you who have never see the movie: the Caucasian kid (Daniel) asks the Japanese-American war hero (CMH) - Mr. Miyagi, to teach him karate. 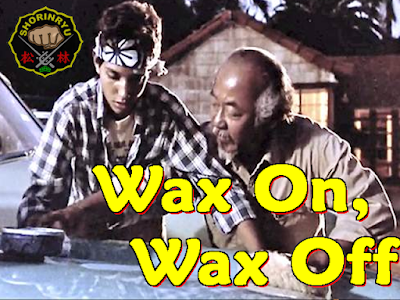 Mr. Miyagi agrees and then proceed to teach Daniel how to wax Migayi's car by applying the wax with his left hand in a counterclockwise motion and then buffing the wax off using his right hand in a clockwise motion. When Daniel has had enough and confronts Miyagi about not really teaching him karate, Miyagi punches Daniel who, utilizing the right and left arm movements, intuitively blocks all punches. These basic skills quickly morph into yudansha quality tournament skills and Daniel (spoiler alert!) wins the big tournament. But the "secret" of karate has been unwittingly exposed! When someone starts karate because "I want to learn to defend myself" I encourage them to buy a handgun and get some training. It's faster, cheaper and proficiency can be achieved in a matter of weeks. A good karate student is not proficient in basic self-defense for at least 3 -5 years after beginning training. Sure your develop "islands of skill" before that but generalized skills really do take years. If you are going to a dojo and become a yudansha in less than 3-5 years (without significant previous training) you are dangerous only to yourself. You're dangerous because you may actually believe you have real skills when, in fact they are still developing. Renshi Sam Palmer used to ask "Do you know what they call a 2 year Blackbelt who gets into a street fight? . . . the answer was "A trauma patient." - The secret of proficiency in karate is two fold: Repetition and basics. - The secret of proficiency in fighting with edged weapons is also two fold: Repetition and basics. - The secret of proficiency in kobu-do is two fold: Repetition and basics. - The secret of proficiency in the use of firearms two fold: Repetition and basics. - The secret of proficiency in MMA, judo, gung-fu, even bowling? Repetition and basics. In a fight if you start thinking "I'm gonna do a ni-dan geri then drop into a cobra coil and deliver..." You're tagged! Basics, remember "mizo no kokoro" (mind like water)? If you're "fighting" you'll lose; in the dojo or in the street. Remember "Enter the Dragon": "What's your style?" "I call it the art of fighting without fighting." In sparing, in fighting, one must be proficient enough to "flow" with your opponent. That does not mean simply responding, but rather reading the waves of the flow of the encounter, letting go. The "empty mind" of the beginner must become the "empty mind" of the seasoned karate-ka. In fact, in Buddhism, we call it "beginner's mind". One does not look for openings in a battle, the seasoned karate-ka is aware without being aware. O'Sensei Nagmine said "Zen and the Fist are one". Many misinterpret this slogan. It means (to me) that the same principles, of empty mind, awareness without effort and the absence of "wanting" which are key to Zen are also the keys to karate. No tournament karate but true, spiritual karate. Thankfully the vast majority of karate students never use their fighting skills in a real real encounter. However, on those occasions when they do find themselves in a confrontation they do NOT utilize neko-ashi dachi, chudan soto shuto uke, a ni-dan geri, or plain old flying side kicks. Instead (and the literature supports me) they fall back to basics and use chest blocks, straight punches and front kicks - most of them not delivered in textbook form. I'm sure you ask why? Why does an 8th degree blackbelt, jumped on the street, execute a chudan uke followed by a simple chudan zuki then finished with a mae-geri to the kogan before walking away from the encounter? Simple, because he (or she) has done those techniques so many thousands of times that they are delivered without thinking. The opening is sensed, the technique delivered and it's over. If you have enough time to spot your target then think about where and how you are going to block or strike you opponent, hopefully you're sparring in the dojo. If this occurs when you're on the street you will never hear muzzle report of the bullet that is about to hit you. But back to knife fighting. Knife fighting seminars are extremely dangerous. Not techniques in the seminar but attending the seminar. Taking a seminar on knife fighting can be enlightening, entertaining and down right fun but it doesn't prepare you to defend against a knife nor fight with one. It's the 1,000 repetitions of the techniques you learn at the seminar that helps you begin to get prepared for an edged weapon assault. Repetition and Basics - ALWAYS! If you are going to practice with edged weapons you should follow these guidelines. 3) See one, do one, teach one, repeat. 4) When the "good idea fairy" says "You know, it can't be that hard with a live blade" - don't listen to him! 5) If you have not had a tetanus shot in 5 years, get one from your family physician. 6) Repetition is the key so buy Band-Aids. 7) First, First Aid, step for bleeding is ALWAYS direct pressure. 8) NEVER be the guy who brings a knife to a gunfight!